Our Bold, No Risk, No Bull, Unmatched 110% Make You Happy Or You Don’t Pay, Money Back Guarantee! My name is Dusty Showers. I’m the owner/president of Creepy Creatures Termite & Pest Control here in Palm Harbor, Fla. If you’re reading this right now it’s probably because you’re having an issue with some unwanted pest such as termites, roaches, ants, rats, mice, bedbugs, etc. and you’re trying to decide who to hire to get rid of them. Or maybe you just have a question. Either way, you’ve come to the right place. If you’re like most homeowners…your home is the most valuable possession you own. You want to do everything you can to protect it and avoid damages and contamination from unwanted pests! You want to deal with a company you can TRUST to do the job RIGHT! You want someone who is going to show up ON TIME…EVERYTIME…and get rid of the problem FAST! You want to pay a FAIR PRICE and not one penny more! You want a GREAT GUARANTEE and want to know that the company will stand behind it 110%! And you want to know that, if you ever have a problem…or simply and question…the owner of the company is one phone call away at all time, day or night…even on the weekends! If you agree with the above statements, then keep reading because I want to tell you more about why you should choose Creepy Creatures Termite & Pest Control for all of your pest control needs. A full-time entomologist on staff 24/7, to answer any questions or help advise us on any problem we might encounter at YOUR home or office. Complete 58 Point Pest Analysis of your home or office and findings in writing. A portion of ALL SALES goes to breast cancer research! BOTTOM LINE: If you hire us, we will make you happy or we won’t take your money…period! 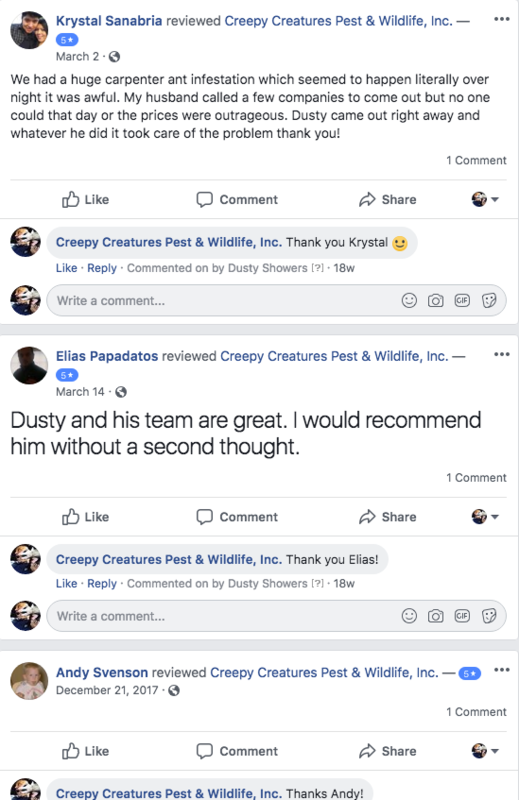 So…if you’ve got a pest problem…or even a simple question…call Creepy Creatures Termite & Pest Control at 727-488-5657 and ask for me, Dusty Showers. I’ll be happy to speak with you any time! Thanks for reading this letter…and I hope YOU have a great day! P.S Consultation is always FREE! Also, don’t forget to ask about our FREE 58 Point Pest Analysis of you home or office! “Very skilled professionals who are also very friendly and accommodating. I have been a customer for 10 years and would highly recommend this company.”–Kathy Murray-Tampa. “It was a Holiday when we contacted Dusty, within two hours the schedule was made to have my home treated. Treatment was performed as scheduled, and was quite polite and professional. The problem was found, treated and taken care of. I owe a BIG and heartfelt “Thank You!” to Dusty and Creepy Creatures!”-Sally M.
“I could hear something in the eaves of my house. I called Dusty and he came right over and found a nest of squirrels! Cute, but not what I really want in my house. I also use Creepy Creature for my bug control and don’t have bugs!”-Paula Delage-Tampa. “These professionals are honest and focused. They zoom in on the problem and make it their priority to resolve the issue. That’s something I appreciate!”-O.L. “This company is so fantastic he explained everything I needed to know answered every question I asked didn’t make me feel like he was rushed and sprayed the inside and out and there goes my bugs friendly friendly service highly recommend this creepy creatures great for the money”-Ginny R.
“Deceased animal removal The technician was great!! !”-Jessy R.
“Creepy creature came right away and best of all NO MORE. BUGS. YEA!! !”-Sue S.
“We had a huge carpenter ant infestation which seemed to happen literally over night it was awful. My husband called a few companies to come out but no one could that day or the prices were outrageous. Dusty came out right away and whatever he did it took care of the problem thank you!”- Krystal S.
“Dusty and his team are great. I would recommend him without a second thought.”- Elias Papadatos-Palm Harbor. “We use Dusty when we have a special problem at our commercial and industrial properties. Wouldn’t think of using anyone else. Creepy Creatures is fast, thorough & economical. What more could you ask for?”-Don Goliher-Clearwater. “Dusty is incredibly knowledgeable. He is my go to guy.”-Austin Anderson-Palm Harbor. “Very knowledgeable. They were able to answer our questions, give us suggestions and solutions our problems.”- Laverne Yoder-Clearwater. “So I called Dusty to handle an exterior pest situation at my business. He showed up on time in a clean vehicle. Before Dusty did anything he explained to me what was happening and why. The truth is that everything he said was going to happen, happened and Dusty handled it all for me. Two thumbs up for that kid.”-Steve S.